This week sees the 40th Birthday of Steven Spielberg's enduring cinematic masterpiece Jaws and to celebrate Bruce's Birthday we have, courtesy of publishers HarperCollins, three paperback copies of Carl Gottlieb's definitive making of Jaws book - the Jaws Log Expanded Edition to give away. What can I possibly say about Steven Spielberg's modern masterpiece Jaws that you have not read countless times before? (Further below I actually do write some stuff you may have not read before) 40 Years on and despite changing audience trends it still holds up as a tension fraught classic. One I have seen in various forms over the years, most recently a screening of the gorgeously restored Blu-ray version, which took me right back to the extreme horror and humour experienced when I first saw it. 1. Jerome Agel's The Making of Kubrick's 2001 - since its 1970 publication Taschen have brought out a number of beautiful and insightful Kubrick books worth investing in. 2. Don Shay's Blade Runner: The Inside Story Transmetropolitan also known as Cinefex issue 9, - David Scroggy's The Blade Runner Sketchbook is also a must see/read but good luck trying to find a copy for a reasonable price. 3.Carl Gottlieb's The Jaws Log. Award winning writer Carl Gottlieb's Jaws Log is exactly that - a log or diary of entries he kept whilst working with original Author Peter Benchley to turn Benchley's novel into the film we now know as Jaws. It's a brilliant and a very easy to digest read, full of fascinating bitesize insight into the making of Jaws. That has been hailed by not just fans but other filmmakers as a definitive class on the background of how a film actually gets to screen. Winner of three Oscars and the highest-grossing film of its time, Jaws was a phenomenon, and this is the only book on how twenty-six-year-old Steven Spielberg transformed Peter Benchley's number-one bestselling novel into the classic film it became. Hired by Spielberg as a screenwriter to work with him on the set while the movie was being made, Carl Gottlieb, an actor and writer, was there throughout the production that starred Roy Scheider, Robert Shaw, and Richard Dreyfuss. After filming was over, with Spielberg's cooperation, Gottlieb chronicled the extraordinary yearlong adventure in The Jaws Log, which was first published in 1975 and has sold more than two million copies. This expanded edition includes a photo section, an introduction by Benchley, and an afterword by Gottlieb that gives updates about the people and events involved in the film, ultimately providing a singular portrait of a famous movie and inspired moviemaking. The Expanded Edition with brand new cover art – features original artwork used by Universal Extras, includes introductions by Jaws author Peter Benchley and Gottlieb, a 22-page behind-the-scenes photo section, and a 25-page “Endnotes” section of updates and additional details on the filmmakers since the release of Jaws. 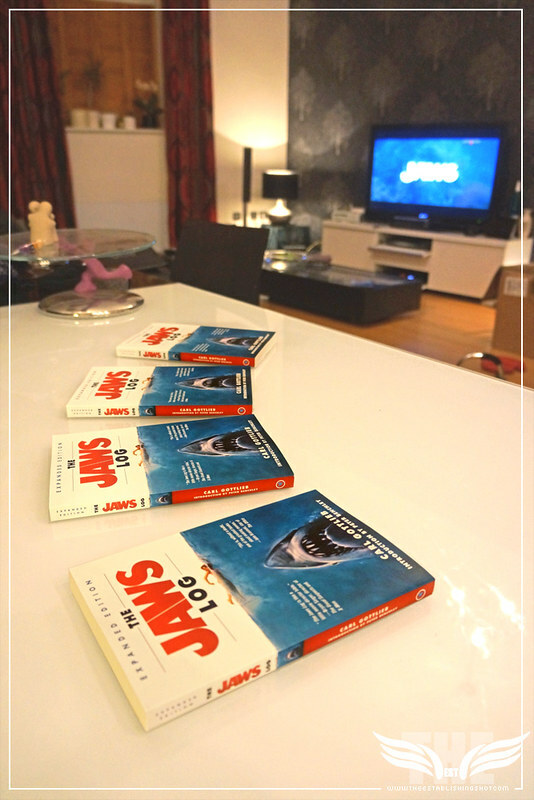 We actually received these prize copies of The Jaws Log to giveaway timed with the release of Jaws onto Blu-ray but they fell down the back of a couch and after rediscovering them - this week, the week of Jaws' 40 Birthday and the start of Summer seems as good a time to give them away as any. See details further below on how to get your hands on a paperback copy of Carl Gottlieb's must have Jaws Log. When a gigantic great white shark begins to menace the small island community of Amity, a police chief, a marine scientist and grizzled fisherman set out to stop it. I never tire of Jaws as new facets of it always seem to present themselves. When I was younger my interest was piqued by the involvement of National Geographic regulars Ron & Valerie Taylor in the production, then on eventually seeing the film - being blown away by the spectacle and horror. For awhile it was all about Roy Scheider's Police Chief Brody a man against a corrupt system as well as a wayward nature. Then it was all about the mastery of a young Spielberg bringing all the elements together into a great film, in spite of ridiculous filming conditions, but currently it's all of those things overshadowed by the the relationship and bond between the three leads Robert Shaw's crusty old sea dog Captain Quint, Richard Dreyfuss' scholarly Marine Biologist Matt Hooper and Scheider's Chief Brody thrown into a situation like a fish out of water. Is there any other film that has successfully brought a similar formula of protagonists to the screen? 1. Bruce the sometimes working animatronic shark known as Jaws was named after Steven Spielberg's lawyer Bruce Ramer. 2. Did you know that between his debut feature film Schlock and making the great Kentucky Fried Movie and huge hit Animal House Director John Landis worked on Jaws. 3. Steven Spielberg was actually the third choice to direct Jaws. 4. Spielberg had second thoughts about being involved in Jaws as he was concerned that he would be known as an action director specialising in contests between brave men and insensate killers. VIDEO: CLASSIC SCENE - JAWS - CHIEF BRODY (ROY SCHNEIDER) "WE ARE GOING TO NEED A BIGGER BOAT"
6. When work started on the film, Peter Benchley's international best seller had not been released as yet. 7. The production requirements of the shark action scenes had never been attempted done before, there was nothing of this scale to compare it to. 8. Richard Dreyfuss had never been on a boat prior to shooting Jaws. 9. Charlton Heston was very nearly cast as Chief Brody. Timothy Bottoms & Jeff Bridges were considered for the role of Hooper and Sterling Hayden was the first choice for Quint. 10. Carl Gottlieb reveals his recollections and evidence off the actual author of the much discussed Indianapolis speech dialogue. First published in 1975, book sold over 2 million copies in 17 printings. 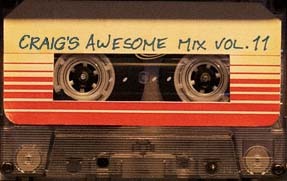 Expanded Edition with brand new cover art – featuring original artwork used by Universal. 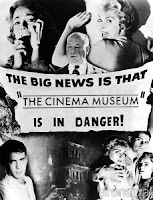 Coincides with August 14th release of DIGITALLY REMASTERED AND FULLY RESTORED BLU-RAY from Universal Studios Home Entertainment. Nearly four decades ago, one film scared audiences from setting foot in the ocean, and revolutionized the way Hollywood markets movies by becoming the first “summer blockbuster.” Then 26-year-old director Steven Spielberg’s second feature film, Jaws has become ingrained in our pop-culture consciousness for its colorful characters, its terrifying effects, and its unforgettable score. The film became the highest-grossing release of its time, and went on to win three Academy Awards®. Written by Carl Gottlieb, the co-screenwriter who worked on the set, side by side with Spielberg, while the movie was being made, the book chronicles the production of the groundbreaking movie with detail and humor. An immediate bestseller upon publication in 1975, selling over 2 million copies and generating 17 printings, THE JAWS LOG is a unique and insightful document on how films get made, and paints a remarkable portrait of young director Steven Spielberg. From the acquisition of Peter Benchley’s novel “Jaws” by producers Zanuck and Brown in early 1973 to the development of the script, from location scouting to misadventures with locals on Martha’s Vineyard, from the casting of Roy Scheider, Richard Dreyfuss, and Robert Shaw to the construction of “Bruce” the shark, through the early test screenings and release of the film, Gottlieb has written a memorable account of the production of one of America’s most acclaimed films, named the #2 thriller of the past 100 years by the American Film Institute. THE JAWS LOG includes a 22-page section of behind-the-scenes photographs of the principals at work and at rest on the set of the film. From checking on “Bruce” the shark’s makeup to sinking and raising the Orca, to the author’s own unfortunate tumble in the water, this whimsical collection of candid shots faithfully captures the filmmakers’ daily struggles to complete Jaws. 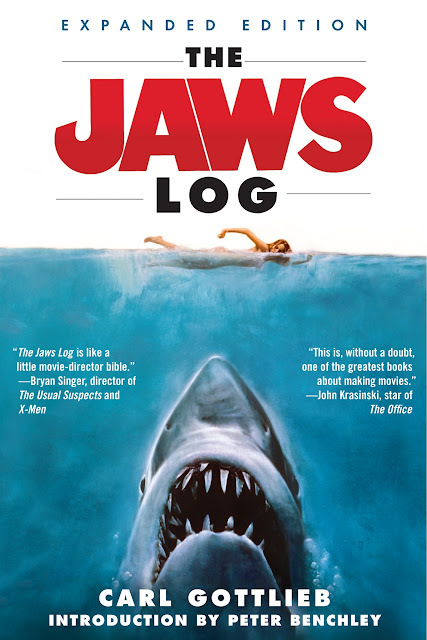 Since its initial publication, THE JAWS LOG has become a valuable reference for filmmakers and film fans alike. Some of today’s most acclaimed directors, including Steven Soderbergh, Bryan Singer, Rob Reiner, John Landis and Rod Lurie, readily acknowledge the insight and wisdom they’ve gained from the book’s pages when making their own films. 1. Send us an email at imaweiner(at)theestablishingshot(dot)com appropriately replacing (at) and (dot). 3. Tell us the size of the boat necessary to catch Jaws. 5. The address where you would like your prize sent to if you win. Standard competition rules and common sense apply. 3 UK Winners will be chosen randomly (by randomly I mean I'll place all entrants names in a roll of tuna, throw the tuna into one of the tanks at the London aquarium, any names not eaten are the winners selected at around 9am on Monday 6 July 2015. The judges (meaning my) decision is final. Winners will be chosen and contacted after the 4th of July weekend.